On January 19th of this year–Martin Luther King, Jr. Day–I was pepper sprayed in the face by an officer of the Seattle Police department. Now, we are filing a lawsuit in a federal court to seek justice. At this year’s Martin Luther King Day celebration, I was deeply honored to be asked to deliver the final address to the largest assembly of the year of social justice seekers. 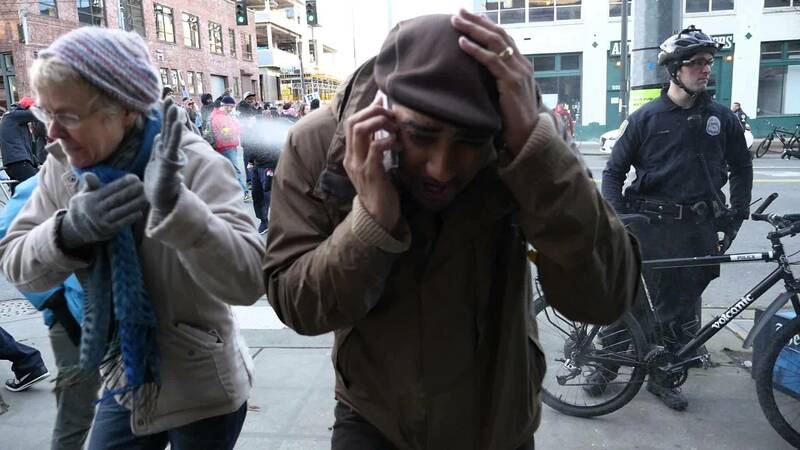 Little did I know that my rally cry at the microphone for police accountability would have such an immediate application, as it was only a short time later that a Seattle Police officer released a hot blast of mace directly into my ear and eyes, scalding my face. On January 19, 2015, Jesse Hagopian was a participant in Seattle’s annual MLK Jr. Day March. Mr. Hagopian, a local human rights advocate and teacher, was a featured speaker at the event. After giving his speech he began to head home. While heading home he was on the phone with his mother. They were attempting to coordinate where she would pick him up and take him to his two-year-old child’s birthday. Mr. Hagopian was pepper sprayed by a Seattle Police officer while he was walking on the sidewalk and talking to his mom. There is video documentation of Mr. Hagopian being pepper sprayed by a Seattle Police Officer. Mr. Hagopian spent the rest of the day treating his injuries. As a direct result of being pepper sprayed, Mr. Hagopians eyes were burning and he had difficulty breathing. His eyes were red, watery and swollen. Mr. Hagopian’s injuries had a severe impact on his ability to participate in and enjoy his son’s birthday party. The injuries that Mr. Hagopian received as a result of this incident have had a significant impact on his physical and emotional health. We are concerned that the Seattle Police Department continues to maintain a pattern and practice of using unwarranted and excessive force against law-abiding people. This has to stop. Much praise to the James Bible Law Group for filing a lawsuit against the Federal Government on behalf of Jesse Hagopian. This was a most egregious act and to think that it could have been worse makes one’s blood boil more. We in my family support Jesse 100% and will do whatever is possible to assist in this action.